(CNN) -- French Prime Minister Francois Fillon has apologized to his opposite number in New Zealand, John Key, over the recent "unacceptable behavior" of France rugby center Mathieu Bastareaud. Bastareaud has now been hospitalized after the furor surrounding his false claim of assault in New Zealand. The 20-year-old Stade Francais player, who is the cousin of Arsenal defender William Gallas, has been hospitalized with psychiatric problems after lying over an alleged assault outside the team hotel in Wellington -- following France's 14-10 defeat against the All Blacks on June 20. Fillon told Key in a letter: "France's tour of New Zealand has been marked by the unacceptable behavior of one of our players. "Our two countries share the culture of rugby. This sport has always allowed us to meet and to share a mutual respect. I hope that these sentiments will continue after this regrettable affair." 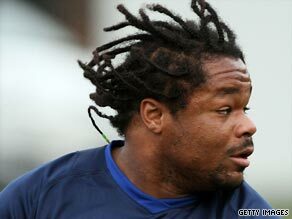 Bastareaud's claim that he was attacked by four or five men outside the hotel shocked New Zealand and led to an apology from Key. But video evidence showed the player had entered the hotel on Sunday morning uninjured and had gone into his room 25 minutes later. Meanwhile, Bastareaud, who was admitted to hospital on Monday, received support from the French players' union Provale. "We, professional rugby players, lend our friendship and support to Mathieu Bastereaud and his family," Provale said in a statement. French Rugby Federation (FRF) president Pierre Camou also offered his apology to New Zealand over the affair that blighted France's All Black tour. A FRF statement declared: "To be an international carries with it responsibility as a representative of your country and your federation. "The FRF is shocked that one of the French team has lied. The New Zealand nation and the world of rugby can legitimately feel wounded by the player's initial statements which have also tarnished the image of French rugby." Bastareaud returned home early from the tour to treat his facial injuries as the rest of the French squad travelled on to Australia and on his return issued an apology saying he believed he had to tell the truth following the media furore. He said that instead of being assaulted he had in fact sustained the bruises to his face after a drunken fall in his hotel room. Bastareaud, who had been due to go on a family holiday to the Caribbean this week, is expected to stay in hospital for at least a fortnight under observation.